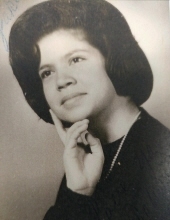 JoAnn Segura, 70 of Denver passed away January 20, 2019 in Golden, CO. JoAnn was born April 1, 1948 to Jake and Sallie Martinez in Denver, CO. She is survived by her husband Danny Segura of Denver, son Christopher Moralez and wife Shannon, grandchildren, Brina Moralez, Maci Moralez and Meah Moralez, brother, B.J. Martinez and wife Hazel,sister, Carol Mora and husband Pat and many others such as nephews, nieces, friends and pets. Memorial Mass, Light of The World Catholic Church, 10316 W. Bowles Ave. Littleton, CO 80127, Saturday, January 26, 2019 at 10:00 AM. A reception to follow at "Miralago Club House", 4760 S. Wadsworth Blvd. Parking is available on the street or in open visitor parking lot. To send flowers or a remembrance gift to the family of JoAnn Segura, please visit our Tribute Store. "Email Address" would like to share the life celebration of JoAnn Segura. Click on the "link" to go to share a favorite memory or leave a condolence message for the family.